In this module, we provide some guiding principles, and pathways to help guide ethical decision-making. These are a series of basic questions that should be asked when confronted with ethical dilemmas. These are often complex situations with no clear-cut resolution, and without a right or wrong answer. But these decision-making processes will go a long way towards helping all of us make informed decisions that can justify consequent actions. Ethical Reasoning Can Be Taught: Ethical reasoning is a way of thinking about issues of right and wrong. Processes of reasoning can be taught, and school is an appropriate place to teach them. the reason that, although parents and religious schools may teach ethics, they don ot always teach ethical reasoning. See the article by: Sternberg, Robert J. Teaching for Ethical Reasoning in Liberal Education. Liberal Education 96.3 (2010): 32-37. Take a look at the video on [linkhttp://ethicsunwrapped.utexas.edu/video/causing-harm 'Causing Harm']--"Causing harm explores the different types of harm that may be caused to people or groups and the potential reasons we may have for justifying these harms." From "Ethics Unwrapped", McCombs School of Business, University of Texas-Austin. The following is a summary of: Seven-step guide to ethical decision-making (Davis, M. (1999) Ethics and the university, New York: Routledge, p. 166-167. For example, "there's something about this decision that makes me uncomfortable" or "do I have a conflict of interest?". Many problems disappear upon closer examination of the situation, while others change radically. Identify relevant factors (internal and external). Be imaginative, try to avoid "dilemma"; not "yes" or" no" but whom to go to, what to say. harm test: Does this option do less harm than the alternatives? publicity test: Would I want my choice of this option published in the newspaper? defensibility test: Could I defend my choice of this option before a congressional committee or committee of peers? reversibility test: Would I still think this option was a good choice if I were adversely affected by it? colleague test: What do my colleagues say when I describe my problem and suggest this option as my solution? professional test: What might my profession's governing body for ethics say about this option? organization test: What does my company's ethics officer or legal counsel say about this? Review steps 1-6. How can you reduce the likelihood that you will need to make a similar decision again? Are there any cautions you can take as an individual (and announce your policy on question, job change, etc.)? Is there any way to have more support next time? Is there any way to change the organization (for example, suggest policy change at next departmental meeting)? A Seven Step Process for Making Ethical Decisions--An example from the "Orientation to Energy and Sustainability Policy" course at Penn State. 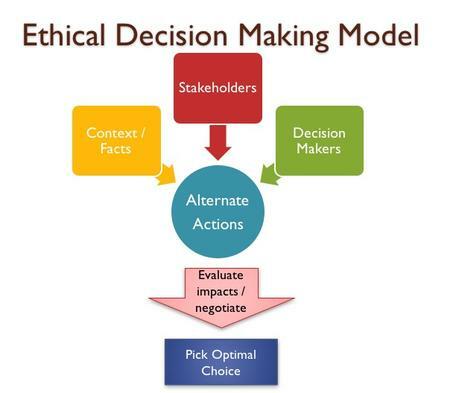 Ethical Decision-Making Model based on work by Shaun Taylor. Provenance: Used by permission of Shaun Taylor. Apply different values, rules, principles, regulations to the different options. Resolve conflicts among values, rules, etc. Make a decision and act. The American Counseling Association has published their A Practitioner's Guide to Ethical Decision Making (Acrobat (PDF) 20kB Jun18 18) (1995) authored by Holly Forester-Miller, Ph.D. and Thomas Davis, Ph.D.
Assessment and Evaluation -- from the National Academy of Engineering, Online Ethics Center for Engineering and Science; -- recommended criteria and rubrics for assessing student learning and an annotated bibliography! Carpenter, D. D., Harding, T. S., Finelli, C. J., & Passow, H. J. (2004). Does academic dishonesty relate to unethical behavior in professional practice? An exploratory study. Science and Engineering Ethics, 10(2), 311–324.